Yitzhak’s installation The Concert, specially created for the Bill of Lading exhibition, is based on Johannes Vermeer’s famous painting of the same name. The original painting depicts three characters engaged in the music making. In the foreground, musical instruments lie at the foot of a table over which is draped a richly patterned rug. Behind the musicians hang two paintings: one is a pastoral landscape, and the other – The Procures by Dirck van Baburen. Yitzhak recreates the painting, as a theatre backdrop, challenging the viewers and, through her focus on nuances and marginal details of the original work, telling them a revised narrative. 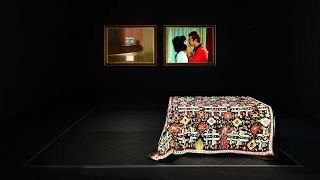 The Oriental rug, which appears in many of Vermeer’s works as a prominent decorative display, suggesting its function as a marker of economic success, is reassembled here through elaborate digital work that underscores its nature as an artifact that undergoes a transformation in its transition from one culture to another. Whereas the figures of the musicians are missing from Yitzhak’s work, the music – perhaps the most vital absence in Vermeer’s painting – is brought into attendance and converses in various ways with the images Yitzhak has chosen to project within her frames. One of these frames features edited clips from the film The Wife of an Important Man, (Zawgat ragol mohim) Egypt 1987, staring the celebrated Egyptian actress Mervat Amin. The close-up images of simple, everyday domestic activities are here charged with a new set of associations and perhaps also an underlying air of menace. The second frame shows a seduction scene from the film Eve and the Wolf (Leqa ma al-madi) Egypt 1975, also starring Amin, which echoes The Procures in Vermeer’s work. Both images address the stifling of sexuality through a cultural act (whether it is a concert, the techniques of cinema, or the video work itself), which for Yitzhak serves also to highlight the Orientalist perception of the East as sensual and feminine and the way in which this perception has been used by the West to justify cultural and political mechanisms of power.